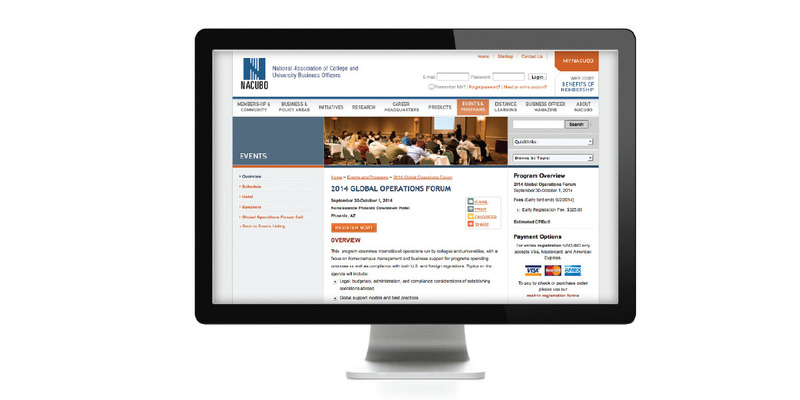 Three recent NACUBO events—the Global Operations Support and Compliance Forum, the Student Financial Services (SFS) conference, and the Higher Education Accounting Forum (HEAF)—are now available online. The Global Operations Support and Compliance Forum examines international operations run by colleges and universities, with a focus on home-campus management and business support for programs operating overseas. SFS covers the policy, technical, and management issues affecting student financial services operations on campus. HEAF offers the latest information on trends and best practices in financial accounting and reporting, managerial analysis, and leadership issues for all types of institutions. The programs are available online for you to experience from the comfort of your own offices. For each program, NACUBO is offering your entire team one price. When one person on your campus registers at the full price, other staff can register for free. Each additional attendee must complete the online registration process to have full access to the event. All online attendees will continue to have access to the content for one year from the release date of each program. For more information, visit www.nacubo.org. What changes did your organization make to asset allocation as a result of the financial crisis? At a recent webcast on asset allocation and rebalancing, speakers discussed how during the financial crisis, institutions could have implemented innovative techniques that apply a unique approach to not only asset allocation, but also rebalancing. Attendees learned about the results of a study that evaluated the impact of various rebalancing strategies through the financial crisis and recovery, and how each strategy affected the volatility and return of a diversified portfolio. To watch a recording of this webcast, visit the on-demand section of the Distance Learning page at www.nacubo.org.